Introducing the all new Technine Custom Pro DS Snowboard Bindings Skiboards with Summit Riser Kit. These were designed by us to work perfectly with skiboards, while allowing you the comfort of using snowboard boots on your skiboards. These Technine Custom Pro DS Bindings include the Summit Snowboard Binding Riser Kit to allow just the right elevation to carve deep turns. The Custom Pro DS Snowboard bindings feature 3 padded rachet straps to hold you in place when carving. This allows a more stable interface between boots and bindings. The benefit of this is maximum power transfer to your skiboard edges with no lag. This has always been a problem UNTIL NOW!! The Custom Pro DS features a partial wrap around cuff at the top (referred to as a “double scruff” or DS for short) that provides additional stability and even quicker response for aggressive carving and maximum performance with skiboards. Slightly stiffer Pro frame heel cup for more performance is made of solid aircraft aluminum. Heel cups allow the boot and binding to act as one allowing fast edge-to-edge carving. The Eva tech foot bed was created to eliminate foot fatigue. This foot bed is a pad that provides shock dampening. An additional rubber pad underneath the binding adds to the dampening as well. Eva pads on top and underneath the metal base allow for comfort. The three rachet buckle straps make it easy to get just that perfect fit. 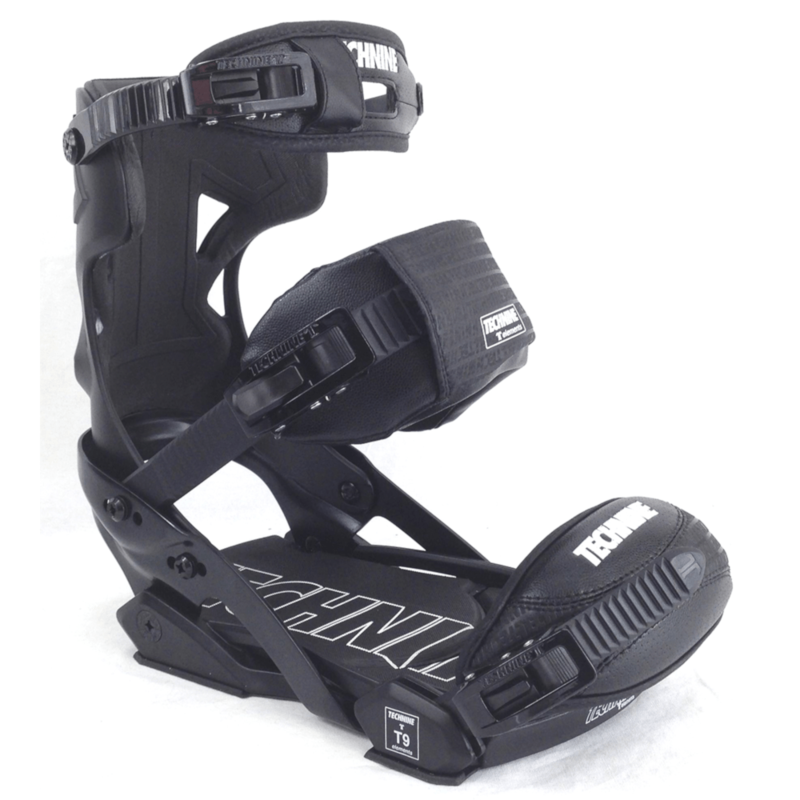 With these bindings you can achieve complete support for your boot front and back and side to side. 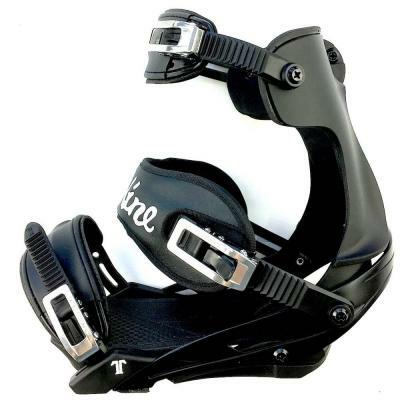 A front cup toe strap keeps boot firmly in place preventing forward movement within the binding. These comfort king straps are wider and cushioned and upper two straps allow just enough flex for those occasional traverses. Fits snowboard boot sizes 7-14 US. Made of solid polished aluminum, powder coated for durability against the elements, these provide a platform for the snowboard bindings to be mounted to your skiboards. Kit includes 8 longer screws (4 per plate) to simply tighten the snowboard binding to any skiboards with the 4 hole insert mount. 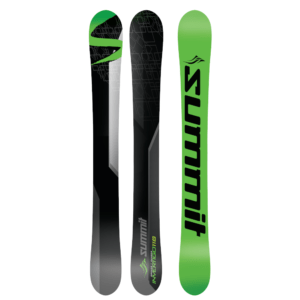 These Summit Riser Plates are light weight, with rock solid durability. Riser plate rests on a 3″ round hard disc that allows for maximum performance with total power transfer from boots to skiboards. Circular disc allows your skiboards to flex through the full range of possible edging and eliminates dead spots.These riser plates offer just the right amount of rise so you can still make those aggressive lay-it-over carves while using snowboard bindings. Custom comfort molded eva pads dampen vibration and provide grip to eliminate heel lift. Forward lean adjustment is customizable. Rubber cushions in front and back of plate allow full flex as well as dampening, yet do not inhibit “road feel”. This kit includes Technine Custom Pro DS Snowboard Bindings, all hardware, Summit Riser Kit with all hardware and two Quick Leashes are included as well. Everything you need to mount and ride with snowboard boots on skiboards. Using Snowboard Bindings with Skiboards – How do they perform?